1.Line an 8x8x2-inch baking pan with foil, extending foil over the edges of the pan. Coat foil with cooking spray. Set aside. 2.For crust, in a food processor pulse oats until fine. In a medium saucepan combine 1/4 cup of the chocolate pieces and the butter; heat and stir until melted. Stir in the processed oats, finely crushed chocolate wafers, cocoa powder, and salt. Press crust mixture into bottom of the prepared pan. Chill for 15 minutes. 3.In the same saucepan combine the remaining 1/2 cup chocolate pieces and the shortening. Heat and stir over low heat until melted and smooth. Set aside. 4.In a medium bowl combine powdered sugar, cream cheese, milk, peppermint extract, vanilla, and, if desired, food coloring; stir until smooth. Spread over crust. 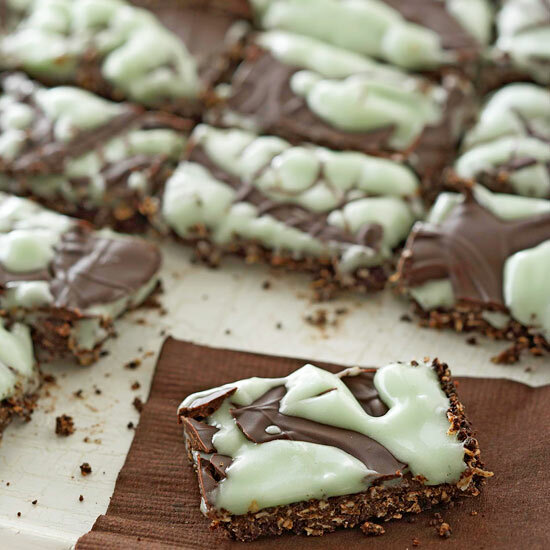 Drizzle with the melted chocolate mixture. 5.Chill about 1 hour or until set. Using the edges of the foil, lift the uncut bars out of the pan. Cut into 24 bars.